Slave-taking aliens kidnap Bill MacCarthy and Jane Yamaguchi from the remote Rocky Mountains. But the aliens are in for a surprise! Bill is a retired Navy SEAL and Jane is an Air Force Space Command captain. Together they must breakout from escape-proof cells, fight the ship's crew, capture the captain and take over the starship - all before they are delivered to buyers on an alien world. Along the way they gain alien allies, including a naive ship AI. But will their escape survive a space battle at the Market world where captives are bought and sold? All that is certain is it was a bad move to kidnap a SEAL! There are some really nasty Aliens that capture intelligent creatures from undeveloped worlds all over the Galaxy and sell them for genetic experimentation, gladiators and whatever only this time they make the mistake of picking up a Navy SEAL Chief Petty Officer and a female. Captain from the Air Force Space Command. They and a group of talented fellow captured aliens take over the ship and start turning the tables on the Slave Traders. Good villains, good fights and good space battles. The narrator did a great job of handling all the voices and kept he action moving. I definitely plan to give the sequel a listen! Escape From Aliens is a fast moving space adventure that keeps its audience guessing what will happen next from the first moment until the last second. The author has created sa cast of aliens from different worlds all with different appearances and voices which the narrator interprets with great aplomb. I would have liked to learned more of the back story of the characters, but I am sure that will come in the author's sequels. The listening experience reminded me of playing a highly engaging adventure game on the internet. Give it a listen. I think you will be pleased. Not perfect -- but enjoyable. Both the story and narration could be better. If you like SiFi that allows the good guys to win without loss then this is for you. Will I buy the sequel? Yes... Though unless the writing changes this series will not on the level of Christoper G. Nuttal's the Empire Corps series nor the Expanse series. Good action adventure SciFy book. The noble mission to end the Galactic slave trade made me want to join the crew. Hope they do the sequels soon! Would you consider the audio edition of Escape from Aliens, Book 1 to be better than the print version? Pretty traditional Space Opera but the slave angle and the number and variety of aliens make it stand out. Good narration helped. Looking for the sequel. What was one of the most memorable moments of Escape from Aliens, Book 1? Bill using feces to block the air vents in his cell to force them to open his door. Which character – as performed by Somerset Hamilton – was your favorite? Reader does a voice over for the ships IA that is just awful. 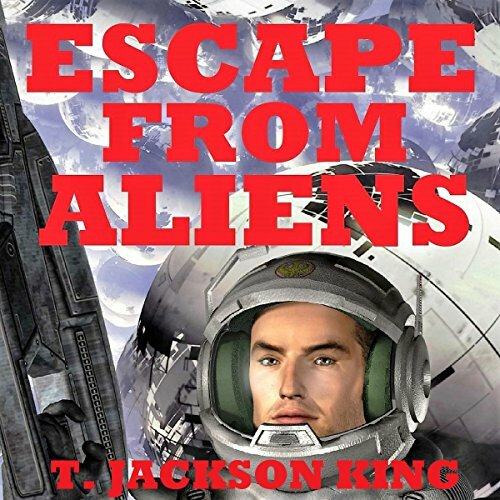 Has Escape from Aliens, Book 1 turned you off from other books in this genre? If you could play editor, what scene or scenes would you have cut from Escape from Aliens, Book 1? I like the story concept and I think overall I will continue to read the series. The problem I have with the book is that the writing is a bit childish, not realistic, and the narrator who has a good overall speaking voice seemed to enhance the writing issue with some of his word emphasis. I do think the tech that was involved was done well but the pirate crew was a bit weak and didn't rise to the level of what I think a starship crew would be. I liked the story line about alien abduction and the tables being turned on slavers. It is a bit like a pirate story. I also liked the concept of an AI running a ship. Would you be willing to try another one of Somerset Hamilton’s performances? Yes, I think his speaking voice is okay, better than some I have listened to. I just don't think it worked with the writing very well. Do you think Escape from Aliens, Book 1 needs a follow-up book? Why or why not? Yes, I want to see how things end up. I would suggest that the author, who does seem to have good ideas, work a bit more on realistic character development and interaction. Not really. A good start that went all squishy. Would you recommend Escape from Aliens, Book 1 to your friends? Why or why not? No one over the age of 12.
Who would you have cast as narrator instead of Somerset Hamilton? You mean Mr. Rogers? Needed someone a little "tougher". Lame, waste of a credit. I had a hard time finishing this. Reminded me of the old "Tom Corbett, Space Cadet" Stories.